Roadside Couch records (subsidiary of Firstcom Music) released Big Whisper during the first quarter of 2013. This 16-song collection of music for film and television boasts a sensational collection of singers from Portland, OR and Nashville. Writers/producers Daniel Portis-Cathers and Rand Bishop tackle relationship complexities with "songs that cut to the heart of modern romance and sum up the struggle for meaning and recognition in an increasingly chaotic world". 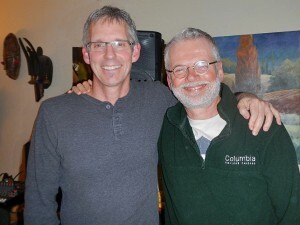 A release party was hosted by Portland artist, Michael Schlicting. Portland singers Brenda Dickey and Jacob Westfall (soloists with the Big Whisper band) were present to kick out the jams and rock the blocks on Rise And Fall, Lazarus and No Tears Allowed. The concept behind Big Whisper was to form a band that would provide an overall unifying sound. Subject matter for the songs was geared toward the dramatic category of the television/film market. Occasional quirkiness with a generally introspective singer/songwriter approach characterizes many of the songs - which lends itself to use in this particular genre of tv/film programming. Here's hoping!